Gourmet Magazine may be gone, but one can still catch episodes of Gourmet's Diary of a Foodie on PBS. In an episode seen not long ago, Ruth Reichl whipped up this Korean panchan-style dish. It looked quick and easy and a great way to use up that block of tofu that was getting dangerously close to its sell-by date. Despite going against a major rule for preparing tofu - boiling it rather than pressing all of the extra moisture out - it retained a nice texture and was not at all water-logged. Although Reichl used soft tofu, the technique worked great with extra firm. And it was delicious. With all that garlic, scallions, and soy, how could it not be? Rinse tofu, then cover with cold water in a medium saucepan. Bring to a simmer over medium-high heat. Lower heat and cook for about half an hour. In a bowl, mix the remaining ingredients together. Just before serving, carefully lift tofu from saucepan with a large spatula and drain on paper towels. Gently pat dry, then transfer to a bowl. 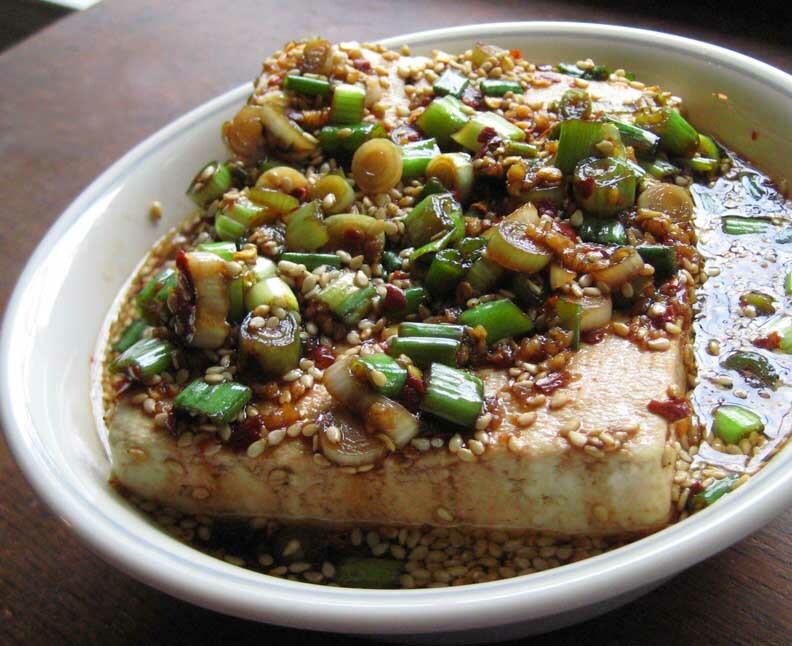 Pour sauce over tofu and serve.